"why can the eye have a wide coverage (I think less than 24 or even 20mm) yet it doesn't have that 'distortion' that ultra-wides do. How come!?" and how we see, can be explained in structural/chemical/electrical terms, just as photography can, and the physical structure of the eye does explain the perspective (and to some extent, the angle of view) that we see, and it can be discussed in photographic imaging terms. The brain perhaps serves to interpolate missing parts in our field of view; to sharpen some of the raw image material; to adjust the overall and local color balances we perceive; to allow us to perceive in one view an extreme range of tones without losing local contrast and brilliance (see "On Brilliance, Contrast, And Signal Processing In Images"); to adjust the number, sizes, and locations of the points of attention in our field of view; and to do a few other things - but the basics of our eye-perspective is in the eye structure. (In all of the following, I am referring to the total view of both eyes together [there is considerable overlap of coverage near the center of the field, which provides for our binocular vision depth perception]). I will take "distortion" first. It is a word that should be used carefully (but often isn't in photography), since it refers to specific things. 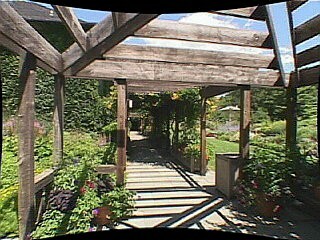 There are several types of perspective (rectangular [which most camera lenses approximate], cylindrical [as seen in swing-lens panoramic camera images], spherical [otherwise known as "fisheye"], orthographic fisheye [similar to spherical, but with less curvature of off-center straight lines over most of the field, but more near the edge], the "non-perspective" "quasi-isometric" projections of old Japanese paintings and drawings and many architectural and engineering drawings [in which there is no convergence], and possibly a few other types). If the image perspective follows the rules of the perspective type used, technically there is no "distortion", odd as the image may appear. For the key to beginning to understand what we see, a look at the eye structure (and its surroundings) is in order. The eye is (roughly) a sphere with a single-element lens placed somewhat below the surface of the front, with a photo-sensitive area occupying approximately the rear half of the interior surface of the sphere (photo sensitivity in this area is not uniform - greater color and sharpness capability is concentrated near the center, with greater low-light sensitivity appearing off-center). The lens is somewhat forward of the front edge of the light sensitive hemispherical area. The eye sits in a facial surround (eyebrows, cheeks, eye-lids, eye-lashes, etc.) which, combined with the characteristics of the eye structure, limit the field of the two eyes combined to an illuminated view of about 180-200 degrees horizontal by about 110-120 degrees vertical (this varies somewhat among individuals, depending on the particulars of their physical structures) - with a rounded and softened field edge (see an approximation here). Within that field, sharpness and color perception is not uniform, with excellent sharpness possible only in a very small central area, though useable sharpness and color sensitivity may extend out to about 160-180 degrees. Most peoples' attention is concentrated in a VERY small area near the center of the field, with some of the remaining field surrounding the center being used for (unattended) context for the center, and with the area near the edge of the field being used only to perceive light and motion. Given the above, it is possible to construct an approximation, in photographic terms, of what we see. as approximating the view of a VERY long telephoto lens (maybe 5000mm for a 35mm camera). (Here it should be noted that over a narrow angle, all perspective types look virtually identical.) Surrounding this is a very noticeably less sharp area (still with excellent color) which is much less attended, and which serves as context for the central image (the angle of view of this area [but not the perspective!] approximates that of a 20-28mm lens for the 35mm format for many people [or a somewhat shorter or longer lens for some people]). The outside area, extending out to as much as 200-220 degrees horizontal (yes, it is possible to see somewhat behind the plane of our eyes! ), approximates the view of a 6-8mm fisheye on a 35mm camera (with much of the top, and some of the bottom cropped out to form an approximately oval soft-edged image). Awareness of (and in) this outer area for most people is limited to motion and light perception. Color sensitivity and sharpness are poor near the edge of the field of vision. is possible to get an idea of the characteristics of the perspective that we see with (but often do not recognize as the perspective of vision). A single-element lens projects an image of roughly 200 degrees of subject coverage onto a hemispherically-shaped "film plane". The rectangular-type perspective of a simple lens, projected onto a hemispherical surface (to use any other shape would require a vast "film plane" to encompass the image, and illumination would fall off rapidly away from the area nearest the lens) must produce a near-spherical type of image perspective. If this is true, and if the brain does not "correct" the spherical (fisheye) perspective back into rectangular perspective, what are the characteristics (and advantages) of spherical perspective that we should see? One is that rounded objects at normal distances (like people and cars) are not "squashed" (example here) when moved away from the center of vision (as they are in even moderately wide-angle rectangular-perspective photographs). Another is that, over the more limited vertical angle that we see, subject verticals at normal distances (like trees and buildings) remain approximately vertical and parallel with each other when we look somewhat up and down (example here - unlike what happens when tilting even moderately wide rectangular-perspective camera lenses). A third is that near-to-far subject proportions do not look exaggerated (as they can appear to be in many photographic rectangular-perspective wide angle images - example here). These are characteristics common to both cropped fisheye camera images and our vision. 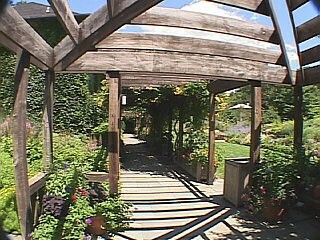 The one bugaboo of photographic fisheye images, though, is the curvature of off-center straight lines. This is most apparent when the subject is abnormally close to the lens, (causing the subject to occupy a large part of the field), or when a long straight line in the subject (like a horizon line) crosses a large proportion of the image field off center (example here). In vision, our limited vertical angle of view (which limits the range of curvature), our reduced field-edge resolution (which helps limit the range of visible curvature and other fisheye image edge effects), and our tendency to attend only to a narrow angle of view at the center of our field of vision (where all perspective types are similar) help to conceal the most obvious differences between spherical perspective and the familiar rectangular perspective produced by "normal" (and somewhat longer) photographic lenses. off-center object. It can take a bit of practice, but do it until it is easy, and you can shift your attention around to any point in your field of view easily. (Some people are able to divide their attention, and attend to multiple points within the field of view simultaneously.) Once you have mastered that, choose a subject in your field of view and adjust the size of the attended area around that subject (it can be any size, and eventually can include the whole field of view at once [Dangerous, but fun while driving! And you will never put up with narrow-angle "lineless bifocal" type glasses again!]). Once you can attend uniformly to most of your field of view, it is easy to find subjects that reveal the off-axis curvature of spherical perspective (looking up at a bedroom ceiling from the bed; sitting on a pillared and roofed porch in the evening; sitting at a desk, facing a wall with bookshelves whose horizontal lines converge both left and right when looking straight forward; looking across a hall, and seeing the same double convergence (which means that the wall-ceiling/wall-floor lines must break or bend - I vote for bend ;-); ETC! Our whole view is composed of curved lines (except for subject straight lines going through the center of view, or segments that are too short to show the curvature), just as with fisheye lenses! For more, see my article, "On Lens Perspective Types".